Of all places, Latin America is the last that the world would expect to produce the man to solve a great mechanical and physical problem. Although both the young aeronaut and his father were born in Brazil the family is of French descent. The elder Santos Dumont was the biggest planter in San Paulo and throughout the country he was known as "the coffee king." So large is the Santos Dumont planta­tion in Brazil that it maintains a private railroad, and this was one of young Alberto's first playthings. The locomotive was his particular attraction, and he studied it closely. When he was twelve —he was twenty-eight on July 20 last—the boy was able to handle an engine. He devoted much of his time to driving one over the plantation. Me­chanics have remained his passion ever since. He was among the first to take up the automo­bile—he has been in France for about ten years—and he is a fear­less chauffeur. Five years ago he became interested in aerostatics, his first ascension in the familiar spherical bal­loon, but he speedily turned to the cylindrical form, believing that he could control it by using one of the compact and light motors built for automobiles. The young Brazilian's advantages are many. He has ample wealth the great cost of experi­ments gives him no con­cern. He has a genius for mechanics. He is absolutely fearless. No danger shakes his judg­ment and the most try­ing and unexpected situ­ations have not found him wanting. Further­more, he is very slight, weighing about a hun­dred pounds—no small aid to an aeronaut. At the same time, he possesses remarkable strength and endurance. At St. Cloud last summer I saw the young man returning from a spin through space with the Santos Dumont V. The flying machine was almost above its shed in the Parc d'Aerostation, and the spectators, who had been watching its graceful evolutions and admiring the navigator's control of his huge craft were waiting for the descent. 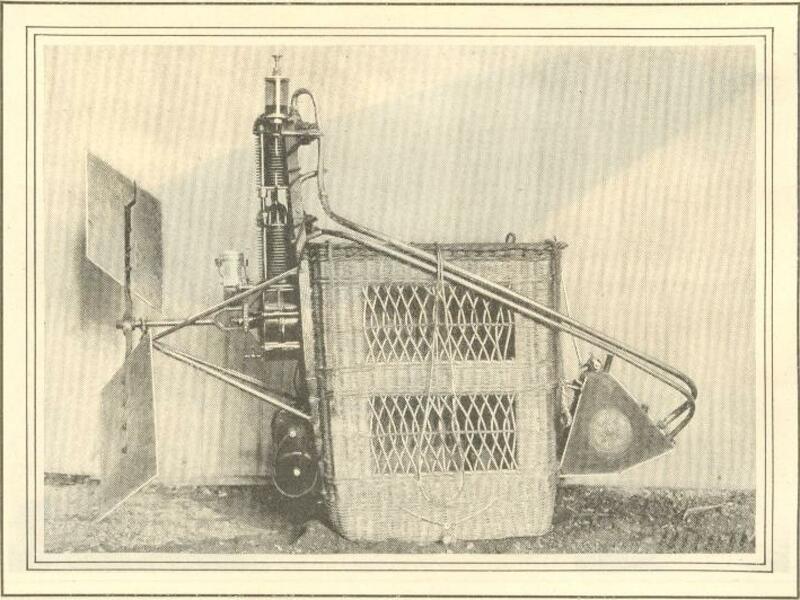 Suddenly Santos Dumont was seen to clamber out of his little car to the slender framework supporting the motor. If he had slipped, if a sudden gust of wind had struck the balloon and caused hint to lose his hold, he must have plunged downward three hundred feet to destruction. The spec­tators gasped and shuddered, and when the aeronaut regained his car in safety they cheered. One of the coupling wires had become jammed against the side of a pulley. It was a most dangerous thing to try to free it but Santos Dumont did not hesitate for a second. But coolness and cour­age alone could not ac­count for the progress made by Santos Dumont. In five years he has con­structed six air ships, and each has been an advance upon its pred­ecessor. He worked long and hard before he was known outside of a small circle of enthu­siasts who have been de­voting wealth and energy to solving the problem of aerial navigation. On the 12th of last July, when the young man made his first flight from St. Cloud to the Eiffel Tower his name flashed over the earth. 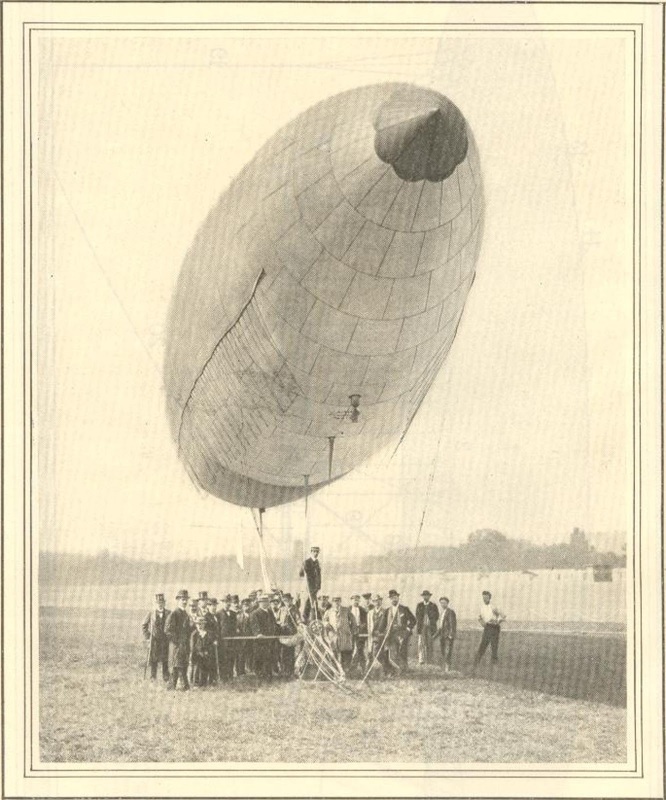 Santos Dumont was trying for the prize of twenty thousand dollars offered by M. Deutsch for the first air ship that should be sailed from the Parc d'Aerostation, at St. Cloud, around the Eiffel Tower and back in thirty minutes. The total distance is a little short of nine miles. The Brazil­ian made the round trip in forty one minutes, being baffled by a head wind when he endeavored to enter the park through it comparatively narrow opening between lofty sheds. When the struggle had lasted five minutes, his supply of pe­troleum became exhausted, the motor stopped, and the balloon was at the mercy of the wind. 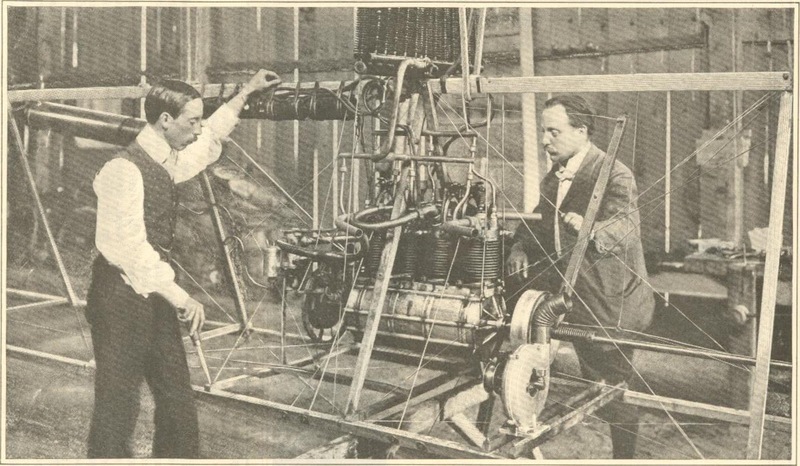 Santos Dumont tore the silk covering in order to make a quick descent, but the machine was blown across the Seine and became entangled in a tree in the garden of M. Edmond Rothschild. The aeronaut made several other at­tempts, in one of which, owing to a leakage of the gas in the balloon, his air ship sank downward, struck the roof of a house, and was completely wrecked, Santos Dumont himself again making a lucky escape. On October 19, with his sixth air ship, he succeeded in circum­navigating the Eiffel Tower and returning to St. Cloud in just forty seconds more than half an hour, coming so near to the stipulated time that M. Deutsch is reported to have said that the prize should be paid to him. Each of the Brazil­ian's six machines has been called the Santos Dumont, with the addition of a distinguish­ing number. The first one collapsed and fell nearly fifteen hundred feet. The Brazilian shouted to those han­dling the guide rope to pull against the wind, and he landed unhurt. In the gradual evolu­tion to the present air ship, most of the changes have been the result of lessons taught by accidents. 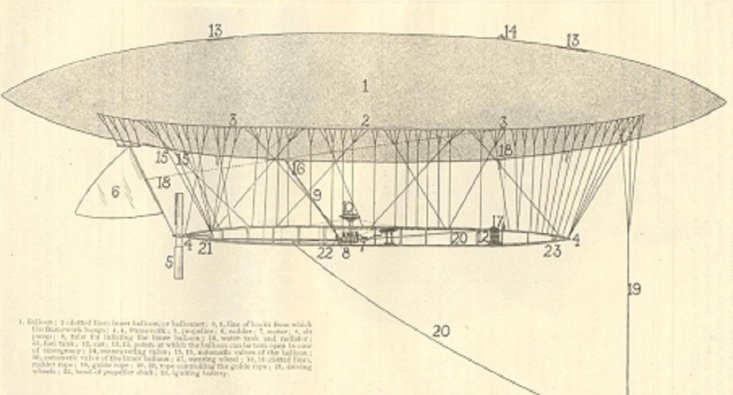 The Santos Dumont VI is a cylindrical balloon one hundred and eight feet long, nineteen and one half feet in diameter, with a volume of eight hundred and eighty cubic yards, to which is attached a four cylindered petro­leum motor weighing two hundred and six­teen pounds and developing twenty horse power. The motor drives a propeller screw, a little more than thirteen feet in di­ameter, which makes three hundred revolu­tions a minute. It also operates an air pump that fills the compen­sating balloon, which will be described. The whole machine is supported upon a triangular frame­work or keel fifty nine feet long. It is made of three curvilinear scantlings hound together and jointed with alu­minum, united by wooden cross pieces, and strengthened by an ingenious net­work of piano wire. About twenty three feet from one extremity of the framework, in the center of the triangular section, the motor is suspended with piano wire. It looks like a gigantic spider in a huge web. Near the opposite extremity, the bow of the ship is a small basketwork car for the aeronaut, from which he controls the machinery. Here are the arrangements for lighting the motor for starting the propeller, for working the rudder, for controlling the escape valves and the "displacement " of the guide rope, which supports a weight that can be shifted towards the stern at the bow, inclining the balloon so that it ascends or descends. The framework, with the motor and the aeronaut's car, is suspended from the balloon by steel wires so fine that of a distance of fifty yards they are invisible. The envelope of the balloon is strong, cream colored Japanese silk, made im­pervious to gas by four coats of linseed oil. It weighs two hundred and forty seven pounds, including the valve placed near the front of the ellipsoid. This is made of walnut wood and has two lids, sixteen inches in diameter, which are opened and closed by means of a cord suspended directly above the head of the aeronaut. The valve is used to allow the hydrogen to escape in case its lifting power, under the influence of heat, should be too great to be overcome by the propeller, and to al­low the gas to es­cape after the balloon has reached the ground. From the upper part of the balloon run two emergency cords conducted to the aero­naut by means of pulleys, which enable him in moments of danger to rip open the balloon and thus allow the hydrogen to escape in large quantities. Santos Dumont has found it necessary to do this several times. In the interior of the balloon proper is fastened a smaller balloon, or ballonnet, as the French call it, having a capacity of eighty cubic yards, filled with air. This compensates the vari­ation in the volume of the hydrogen, which augments or decreases as the air ship mounts or de­scends. As it is of the utmost impor­tance that the great bag should he kept rigid air is pumped into the compensating ballonnet through a silk tube in proportion as the hydrogen contracts. The balloon itself is provided with two automatic valves, which permit the hy­drogen to escape when the pressure becomes dangerous. 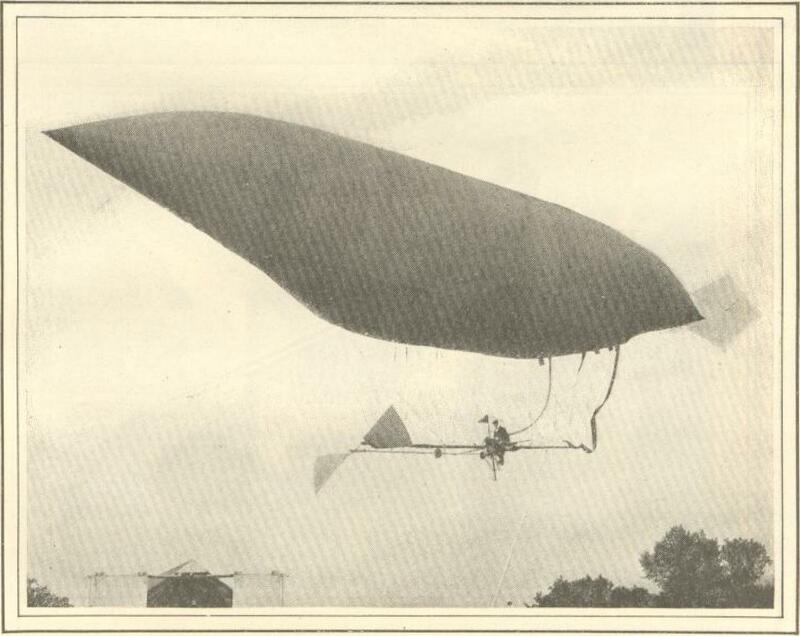 Santos Dumont is the first to give up the net used by his predecessors and to attach his car to the envelope of the balloon itself, a daring innovation that has proved successful. Along the principal are of the balloon little hooks six inches long, are fastened to a silk band. These support the wires that hold the framework containing the machinery. Santos Dumont prefers piano wires because they are very light, have great strength, and offer practically no resistance when the balloon is moving through the air. The motor is surmounted by a thermosiphon radiator, and it has a reservoir containing about five gallons of water for cooling the motor. This cooling appara­tus was added to the latest Santos Du­mont, the heating of the motor having roused much trouble in its predecessors. Attached to the framework, a short dis­tance forward of the motor, is a reser­voir containing about ten and a half quarts of petroleum, sufficient to run the motor for two hours. The electric ac­cumulator for starting the motor weighs six and a half pounds, and is placed at the extreme forward end. The propeller enables Santos Dumont to mount and descend without throwing out ballast or losing gas. The air ship will go in the direction in which it is pointed, and the rudder and guide rope enable the aeronaut to point, it as he chooses. On that July day when Santos Dumont first startled the world, he left the Parc d'Aerostation at 6:41 in the morning. 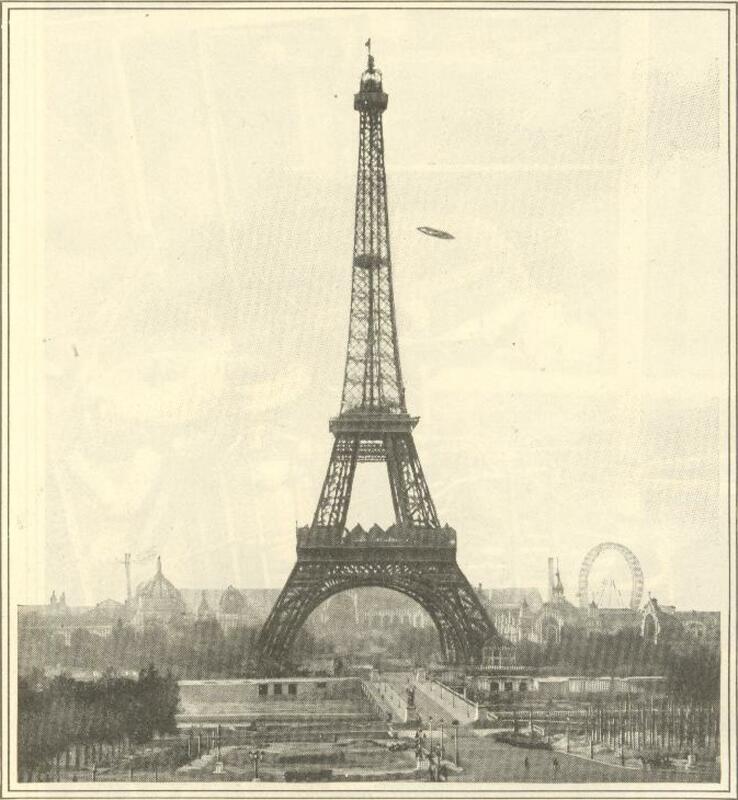 His balloon covered the distance to the Eiffel Tower in thirteen minutes, doubled it at 6:54, and coming back dead in the wind's eye, reached the Aero Club's grounds at 7:22, eleven minutes late. The voyage was made at the rate of more than thirteen miles an hour. Although his machine has been de­molished, the balloon torn to shreds and the framework smashed to splinters. Santos Dumont himself has always es­caped. More than once spectators have held their breath as he came tumbling down to what seemed certain destruction; but he has emerged from the debris with superb sang froid, to give orders to cart away the wreckage and to set about the building of another air ship. "All that I have accomplished," he modestly say, "in all my experiments, in which I have wrecked five air ships, is to be able with tolerable certainty, in fine weather and with a mild breeze, to start from a given point and navigate through the air in any direction, right or left, up or down. To anything more than this 1 have no pretensions. We are at the beginning of the problem, which, how­ever, I am absolutely confident will someday be solved on the lines I have been patiently following." The present tendency of construction he thinks will gradually eliminate the balloon and evolve the true type of air ship. The lifting power of hydrogen, now necessary to overcome the weight of the motor, will be gradually replaced by the mechanical power of the screw. 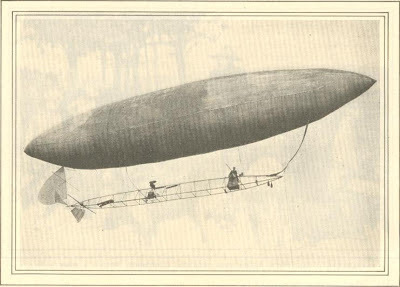 "The chief difficulty will not be in building air ships, but in finding men to navigate them," he continued, "The successful steerer of a balloon like mine must be more than an aeronaut; he must ­be an automobilist as well, and must un­derstand the motor thoroughly. It takes much study and experience. 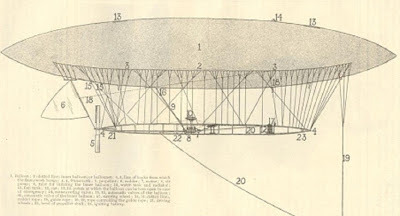 M. Henri Deutsch, who offered the twenty thousand dollar prize, is building an air ship in a structure not far from that which houses the Santos Dumont. M. Deutsch believes in the young Brazil­ian's principle, hut is convinced that a more powerful motor is necessary, and his machine will carry one of sixty horse power, weighing a little less than eight hundred and ninety pound. The balloon will have a capacity of three thousand cubic yards and the framework is ninety-eight feet long. It would be rash to fix a date for the machines first flight. From Munsey’s Magazine – December 1901.